Appropiation is perhaps one of the greatest areas of distress for the contemporary African in America. From Iggy Azalea as a hit making rapper, Angelina Jolie as the epitome of luscious lips to Kim Kardashian as the portrait of round derrieres, black people witness their ridiculed attributes celebrated on whites and non-blacks. While appropriation is typically aligned with clothing and body types, appropriation also extends to food. Eating is a central part to every culture. We eat to celebrate our tragedy, triumphs and new additions. To the African in America, food is not only a source of entertainment and comfort, but a personification of our ability to make something out the nothing allotted to us by white male hegemony. However the “soul” of our food is now in the hands of our oppressors, in a guised manner. The white or non-black ownership is often concealed as an effort to appear a black-owned. This appearance is a strategic means to suggest authenticity, and exploit black community. The following list unveils NYC food establishments that were perhaps originally black owned and become subject to new ownership or those who only appear to be black owned to veil appropriative measures. Started by former Sylvia employee Melba Moore, Melba’s is a cozy, classic and tasty Harlem staple. Known for her Eggnog Waffles and Strawberry Butter, Melba’s offers original spins of traditional dishes in a chic ambiance. Within walking distance from Melba’s Billie’s offers a less formal atmosphere with unforgettable dishes. The fried catfish is to die for, and the mac and cheese is a unique twist to the soul food staple. Billie’s also offers jazz on weeknights for additional ambiance. The owner is often on site greeting each table personally, sharing the story of following her Grandmother’s passion and naming the establishment in her honor. Once black owned, Amy Ruth’s is now under white ownership. Since its acquisition the establishment has expanded, raised its prices but deceiving maintains it’s original menu (with Amy Ruth on the front) and entrees (named after prominent black figures). 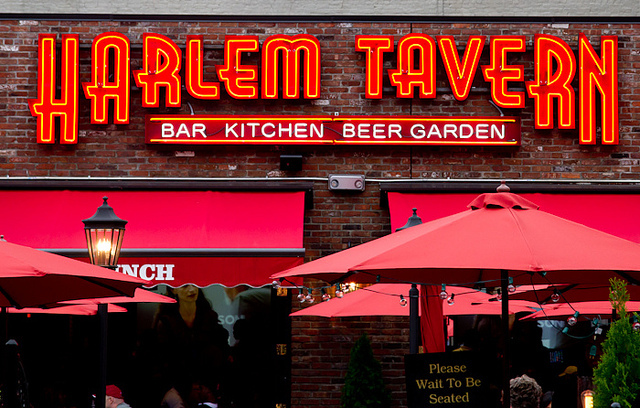 Located alongside the subway, its bustling crowd reflects a gentrified Harlem. A homemade feel with casual dining. Caribbean spice in the heart of Harlem. Red Rooster offers a larger setting than most of its soul food counterparts and soul food seasoned with the medley of cultures that compose the black diaspora. Red Rooster offers live music, dim lighting and somewhat smaller portions for a hefty price. It is also worth mentioning that Rooster, unlike its soul food counterparts exhibits an abundance of white dinners that compose the majority of the dining experience. This abundance undoutedly betrays its surrounding gentrified area. Started by a Mississippi native, A Taste of Seafood culminates a seafood lover’s dining experience. From whiting to red snapper, a taste of seafood has it all. The establishment also offers diversity in preparation, as steaming is an option for both fish and vegetables. Once a neighborhood staple and “hole in the wall,” it’s success garnered a new location with the option to dine in. Black workers, Black cook. Black Patronage. All the signs of a black establishment right? Wrong. This business, named eerily similar to black owned establishment near Central Park West “Manna’s,” is actually owned by Korean immigrant Betty Park. This establishment has since become a chain, the flagship location located adjacent to “A Taste of Seafood.” Manna’s success is probably the best example of how non-blacks capitalize on central aspects of black culture to foster profit, a profit immediately taken out of black community. May this post steer you into placing your black dollar wisely from New York City to your community. Great post! This is a great list. I will have to check these out when I’m in the New York area. I’ve been wanting to go to New York for the longest. It’s on my to-do list.